[S323] Sir James Balfour Paul, The Scots Peerage: founded on Wood's edition of Sir Robert Douglas's The Peerage of Scotland (Edinburgh, Scotland: David Douglas, 1904), volume I, page 30. Hereinafter cited as The Scots Peerage. [S5215] Arthur, Court Satires of the Restoration (n.n. : n.n., n.n. ), page 236. Hereinafter cited as Court Satires of the Restoration. Mary Dutton was the daughter of Henry Dutton. 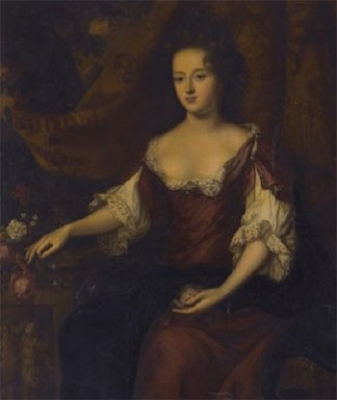 She married George FitzRoy, 1st Duke of Northumberland, son of Charles II Stuart, King of Great Britain and Barbara Villiers, Duchess of Cleveland, circa 10 March 1715. She died on 27 August 1738 at Frogmore House, Windsor, Berkshire, EnglandG. From circa 10 March 1715, her married name became FitzRoy.